A is for appealing. With an aggressive stance, aerodynamic lines and LED lighting, the A-Class wraps a versatile hatchback body in sporty style. Its premium, ultramodern cabin envelops you in spacious comfort in state-of-the-art technology. A forward lean to its grille. And all the thinking behind it. 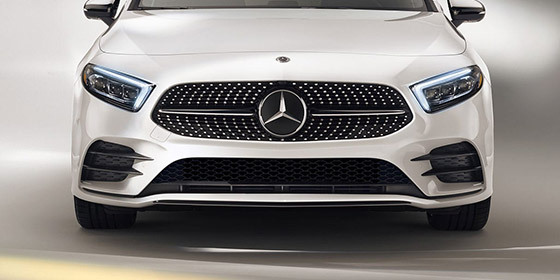 Sleek LED headlamps and a wide diamond-block grille radiate from the iconic central Star. More than symbolic, every detail of its wind-honed body reflects the technology within. Both are designed to stay fresh into the future. Not a single lightbulb. Just part of its brilliance. With 100% LED lighting standard, inside and out, the A-Class shines day or night, coming or going, and staying, too. 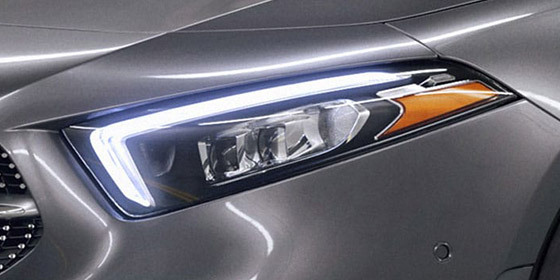 Options include MULTIBEAM LED headlamps and 64-colour ambient cabin lighting. The A-Class matches appealing value with deep Mercedes-Benz values. The cabin is spacious, and the space is flexible. Standard luxuries include heated front seats, a Panoramic sunroof, and dual-zone, double-filtered climate control. An all-digital dash. That responds to your digits. Dual 7-inch digital displays include a central touchscreen to keep you informed and entertained. Available 10.25-inch screens widen their appeal. 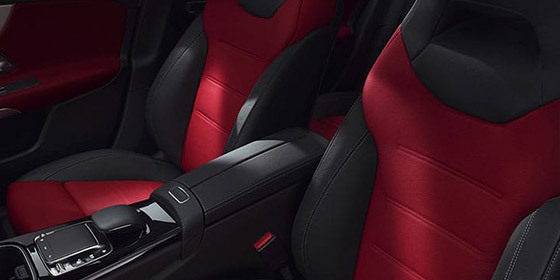 Aircraft-style air vents can be accented with the available 64-colour ambient lighting. Go ahead, be spontaneous. The versatile, carpeted cargo area can hold 370 litres of luggage while five passengers enjoy the roomy cabin. 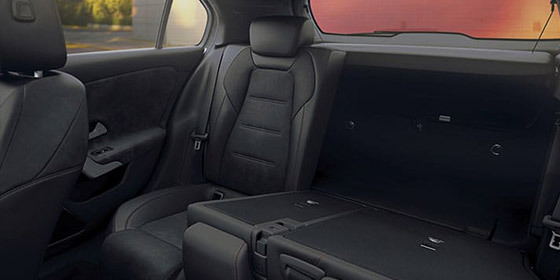 Or fold down the 40/20/40-split rear seat to carry up to 1,210 litres, from gear to groceries. No shortage of personality. With room for yours, too. Sitting sporty on 17-inch wheels, the A-Class is born bold. But why stop there, when you can add any three 18-inch wheel options? Two of them are AMG designs, and they come with a bundle of sporty upgrades outside and in the cabin. A is for athletic. With 221 turbocharged horsepower, seven speeds and four drive modes, the A 250 and all-wheel-drive A 250 4MATIC Hatchbacks are eager to move out. And with a chassis that says A is for agile, too, their moves are smooth and sure. Driving modes to suit your driving moods. DYNAMIC SELECT lets you fine-tune your A-Class with the tap of a console button. Four modes (from ECO to Sport, to make-your-own Individual) fine-tune the shifting of its dual-clutch 7-speed, plus its throttle response, steering feel and more. Agility from every corner, in every corner. The the 4-wheel independent suspension is tuned to deliver precise handling and a poised ride. Along with a long wheelbase and wide track, the ride height is subtly lowered to enhance stability as well as the car’s sporty presence. Confidence in every season, from every tire. 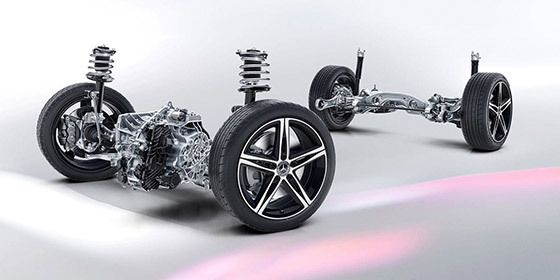 Lightweight, agile 4MATIC all-wheel drive can vary how much torque is sent to the front or rear wheels in response to available traction. It’s engineered to inspire confidence in wet weather, and fuel-efficient fun in dry curves. A is for advanced. With the new Mercedes-Benz User Experience (MBUX), the A-Class cockpit responds to your touch. And with artificial intelligence, it offers what may be the most capable, natural and intuitive speech interface from any automaker. Build it your way. And change it up every day. A spectrum of colour and trim options lets you create an A-Class that suits your style. 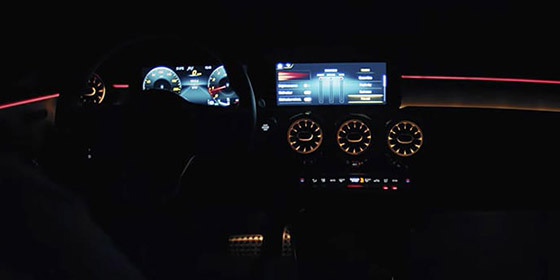 Available 64-colour LED ambient lighting lets you change the cabin to suit your mood. You can even select multicolour and dynamic themes. Say “Hey, Mercedes.” Then say it your way. No need for formal commands with Natural Language Understanding. 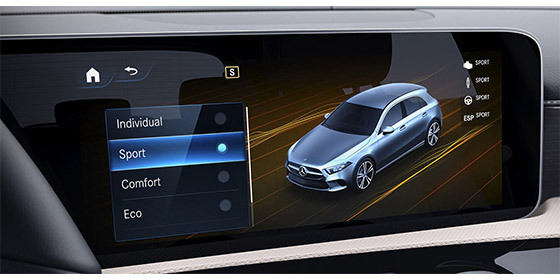 Say “Hey, Mercedes, it’s cold in here” or “I need a coffee,” and MBUX controls many cabin features, or the available MB Navigation, like you’re old friends. See the future. Even when it’s behind you. Visionary technology expands your field of view. 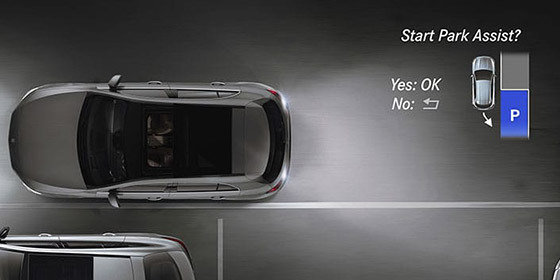 Beyond the standard rearview camera, you can opt for a multiview 360 camera and Blind Spot Assist. Available Active Parking Assist can help you find an open parking spot, then park your A-Class hands-free. Arrive recharged. Without plugging in. 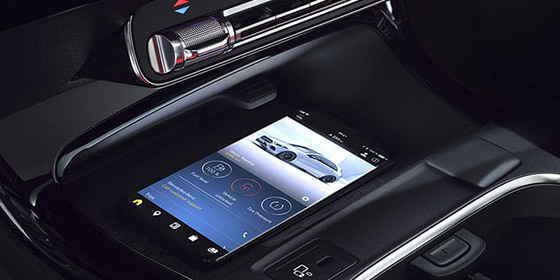 Available wireless charging lets you refuel your compatible phone’s battery as you drive. Easy-connect NFC pairing links your phone every time you get in. Apple CarPlay™ and Android Auto are available, too. And five USB-C ports are standard. Mercedes me connect makes ownership easy. Access Remote Start or Lock/Unlock, see your vehicle status, or schedule service, all from your phone. MBUX can update itself in your driveway. And in-car WiFi is available for a low monthly rate.